This thanksgiving day post is by Mary Ellen. Imagine all the fixing going on in houses all over the country. Smells from the oven. A little bit of bickering. Kids all anxious. People driving. Phone calls to loved ones afar. All kinds of traditions being rehatched. Some new lovers just starting their traditions. Everyone being gay or not. As for our gay house - It is Barb and I and I am thankful. And our wonderful gay birds. The other day I tried to write down where we were for each of our other 22 thanksgivings together. In 1989 we were in Provincetown, MA; in 1993 we were in Boulder CO; in 1996 we were in Albq., NM; in 2001 we were in Florida. In 1995 was the only thanksgiving I was in Massachusetts without Barb, and decided on that day I would never be without Barb on a Thanksgiving. And I haven't. Today, this thanksgiving, we woke up, watched the sky turn from red to orange, made coffee, brought in the newspaper, marveled at the waste of paper of all the ads, put them in the recycle pile without even looking at one of them. We have had pie for breakfast, each went online. I took pictures of our pretty birds. A variety of friends have offered to come by and drop off plates of their special dinners, to share their T-day traditions with Barb and I on this our thankful day together. And as Barb has done for other years on the blog here, I wrote a piece of Thanks for this our Gay Thanksgiving, today November 24th 2011. So here is Sunny today very gay and colorful and proud. 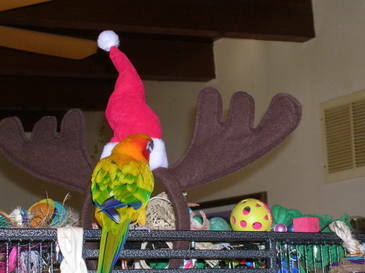 Sunny is very happy he is not a turkey today. 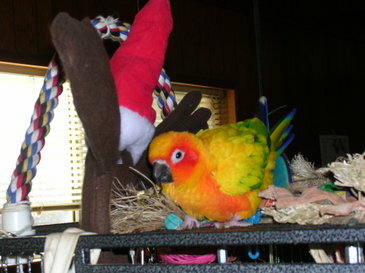 And here is Bosco the little Lovebird with the Big personality. And we cannot forget the flock of Parakeets feasting on their T-day sugar seed stick. And last pic of the day Barb and I. Barb being none too pleased for me to be snapping a pic so early. Too bad honey. It is what it is. We are what and who we are. I am thankful for you in my life more than anything this thanksgiving day. Sunday Bird Blogging: O-Ba-Ma! O-Bos-Co! O-Sun-Ny! Bosco loves his bell toy, and Obama. The rubber chicken? Not so much. 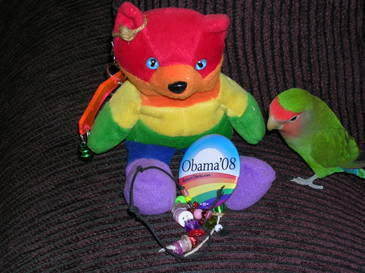 Bosco the peach-faced lovebird has endorsed Obama for President. The other day we caught him chanting O-BAMA, O-BOSCO, O-BAMA, O-BOSCO to the neighborhood avians, promoting both himself and Barack. I guess he's secretly running for some elected office in Birdville. Could it be nest inspector? Toy marshal? We may never know. The bird world is usually mum on that kind of info. I've heard they're very wary about being intercepted by the (bird on a) wire tappers. In the video above, Bosco seems more interested in pinching the feet off the rubber chicken than in giving a few love pecks to Obama. Don't let that fool you. He thinks the rubber chicken is a McCain supporter. And he's not pleased. 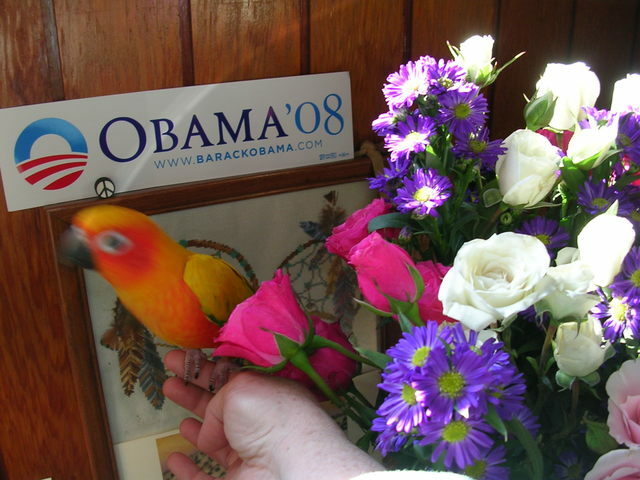 Sunny the sun conure also came out publicly for Obama in the avian media today. As you can see, he was very relaxed, even sleepy, at today's press conference. Well, he HAS worked long and hard for the grassroots group Squawking Parrots for Barawk, so I guess Sunny's entitled to take just a little break on a beautifully sunny Sunday in Albuquerque. No mercy for the humans though -- every second counts! What are YOU doing today and tomorrow and Tuesday to GOTV? I haven't done any Sunday bird blogging for a good long while. Busy, busy. 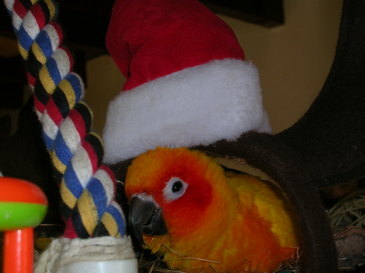 Some folks have been requesting an update, so here's one on Sunny the sun conure. Sunny often watches TV -- he especially likes CSPAN and that parrot ad by Tom Udall -- and all week he's been upset about the ongoing mortgage crisis and the Welfare for Wall Street legislation. 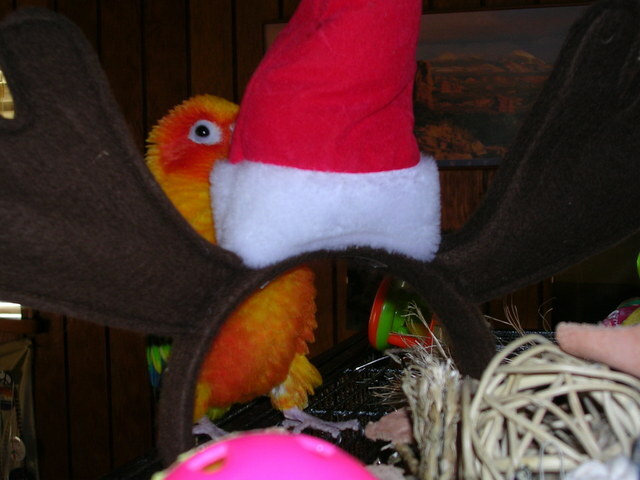 Sunny's elated that Rep. Udall voted against the bill, but all the talk about foreclosures has him uptight. In fact, he's gotten positively territorial about his digs and he's always on the lookout for sneaky foreclosure agents. Nobody's gonna be allowed to take HIS nest, at least not without a fight, as you'll see in the video. Sunny's a populist, just like us. He knows the creatures of the earth have been getting a bad deal from the government, just like ordinary humans. Power to the avians -- and the people! UPDATE 5.24.08: According to a press release from the Obama campaign, the early afternoon event will be a Memorial Day Veterans Town Hall with Barack Obama and Gov. Bill Richardson. Attendance is by invitation only and the Town Hall is not open to the public. The location of the event is not yet being made public. Barack Obama will be in Las Cruces on Monday, May 26, 2008 for a public event of some kind according to his campaign. No other details are available yet, but the word is the event will be related to honoring veterans. I'll let you know when more info is released. In the meantime, content yourself with checking out the video above. Yes We Can! Michelle Obama, John McCain and George Bush will also be in New Mexico next week. Click for info. Sunny the sun conure doesn't celebrate Easter. He dislikes all the egg eating that goes along with the holiday. Can you blame him? He does, however, get off on the arrival of Spring. The increasing hours of light elicit an energy surge within him, as they do for all living things, and he gets very playful and stays up late working on a variety of projects within his "nest." This Spring, he's especially lively because he's so excited about Obama's presidential run. 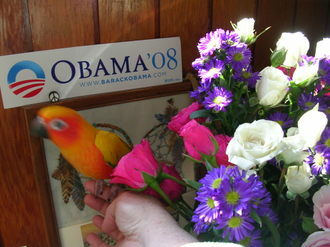 The only downside is that birds can't vote, which Sunny finds highly discriminatory. Still, he believes he can make himself useful by helping to spread the word about a candidate who's all about encouraging the flock to come together for the common good. 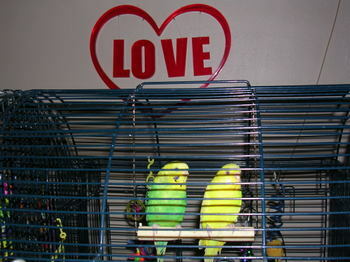 We have new love among our parakeets -- our female parakeets. 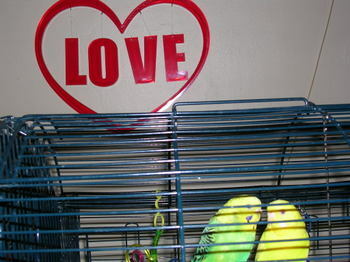 Hambone, the daughter of now deceased mom Whitey and dad Queenie, has allowed herself to be wooed and won by Ginger, our female lutino budgie. It was a long and sometimes rocky courtship. For many moons, Hambone didn't want much to do with Ginger, preferring to busy herself with toys and seed dishes. When Ginger would make an affectionate overture, she'd peck Ginger's head and make threatening noises. Ginger, however, was undeterred and persistent in her courtship. She had it bad for Hambone. Recently, however, Hambone had a change of heart and the two of them can be found side by side most of the day and through the night, often sharing a swing, as above. Ginger feeds Hambone, as any good parakeet lover does with its domestic partner. She sings to her, kisses her beak, grooms her feathers and yes, makes sweet parakeet love with her. This is nature at work -- not the result of any propaganda from the GLBT parakeet community. Obviously, they don't consider it a "sin." 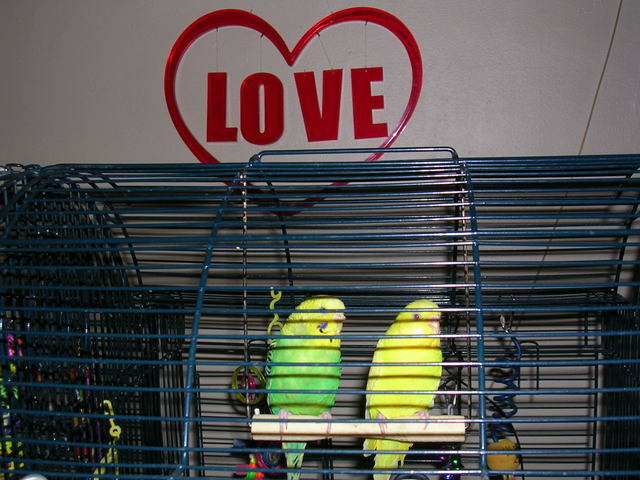 Our other parakeets seem just fine with the arrangement, and grant Hambone and Ginger their space and their dignity despite the couple's obvious difference in orientation. No big whoop. Unfortunately, that's more than I can say for some in the human community, at least here in New Mexico, where Legislators like Sen. Lidio Rainaldi, Sen. Richard Martinez and Rep. Gloria Vaughn hold my civil rights and those of many others hostage in order to uphold some distorted "scriptural" take on matters that are entirely to do with civil law. 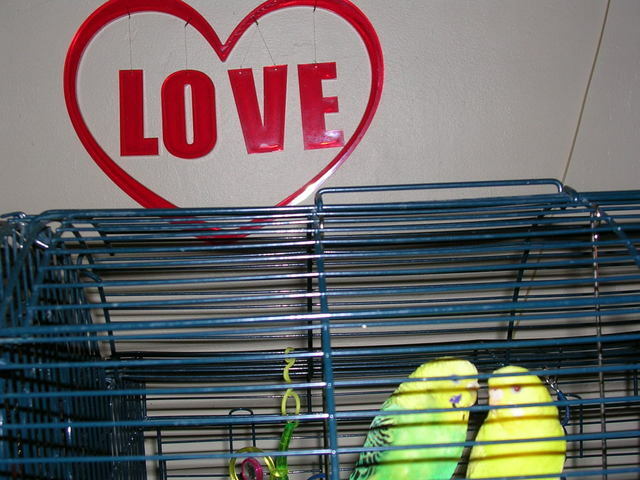 On this Valentine's Day, I hope lovers and partners whose relationships are granted respect, civil law authority and the full rights and benefits due them will consider the plight of couples like Hambone and Ginger, who are following nature's way as it manifests within them. After all, diversity is the norm on this here planet Earth. We're expected to believe that Democrats are breathlessly waiting to hear whether Gov. Bill Richardson will endorse Obama or Clinton for President. And we're supposed to be tantalized by the leaked reports that Richardson is watching today's Superbowl with the other Bill in Red River. Don't believe the spin. Click for a list of Caucus Sites for New Mexico's Democratic Presidential Preference Caucus on Tuesday, February 5, 2008. These sites will be open from Noon to 7:00 PM. To find your precinct, look at your voter card, contact your county clerk or call the Democratic Party of New Mexico at 1-800-624-2457. Click for a NM Caucus FAQ that explains the process. 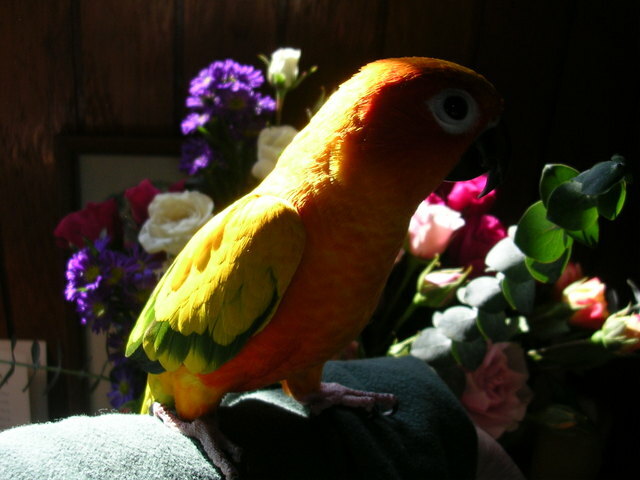 Sunny the sun conure is excited about the 30-day NM Legislative Session that begins at Noon on January 15, 2008. 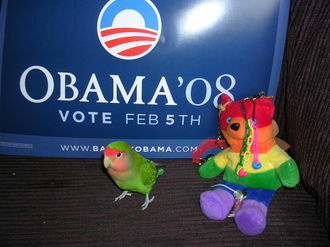 As you can see above, he's a strong supporter of GLBT rights and equal rights under the law for all -- birds included. It's understandable given his rainbow coloring, isn't it? This morning he was reminding us how important it is to work with Equality New Mexico and the legislators to get the Domestic Partnership Act passed this time. Last year's effort was foiled at the last minute by one vote when a certain Northern New Mexico legislator changed his mind and voted against the bill. I guess he doesn't care about giving our state's GLBT citizens (and others who prefer domestic partnerships) some of the basic contract rights that married people take for granted. 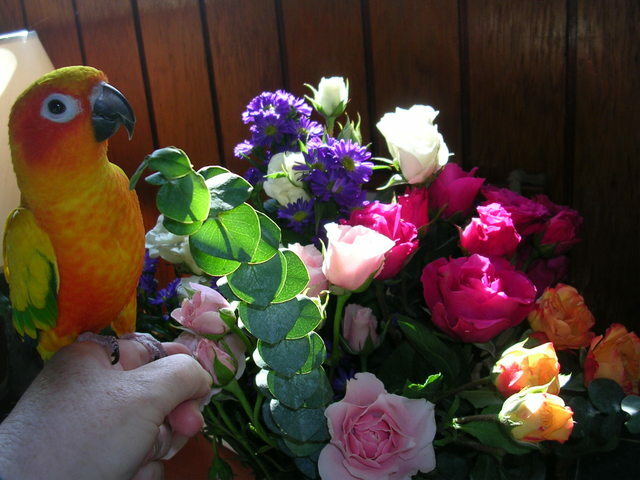 Sunny wants to feel secure about the partnership of the humans he entertains daily in his extended flock, and he can't see why the idea of granting them rights to a civil partnership is a threat to anyone. He's no bird brain! 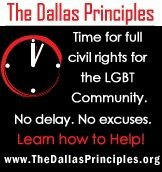 If you agree, it's time to sign up as a supporter of Equality New Mexico, maybe donate a few bucks to the cause, perhaps volunteer some time and start contacting your legislators to urge them to support this year's Domestic Partnership Rights and Responsibilities Act (HB28). The EQNM webiste makes it easy to sign a petition in support of the Act and have it sent automatically to your state senator and representative. The bill (pdf), sponsored once again by the always terrific Rep. Mimi Stewart, has been pre-filed with the Legislative Council Service so advocates can hit the ground running when the Session begins. I'll be following the progress of the bill closely, so stay tuned. Sunny's looking forward to a big celebration when this year's Legislative Session comes to a close. We can do it this year! We dug out our boxes of Christmas stuff and got the outside lights on the house yesterday. Our birds love the hubbub. They seem to think all the decorations are bird toys, unveiled for their amusement. Sunny the sun conure became particularly enamored of a Santa hat with built-in reindeer antlers, so we stuck it on top of his cage this morning and he was in avian heaven. Has he been naughty or nice? Sunny thinks there may be a cracker hidden in the hat. He loves, loves, loves, whole grain crackers. Our birds have really been enjoying the four-day holiday weekend and so have we. They love to have us home and hanging out with them. They play, entertain us with their tricks, beg for treats, sing for us and sometimes even groom us. 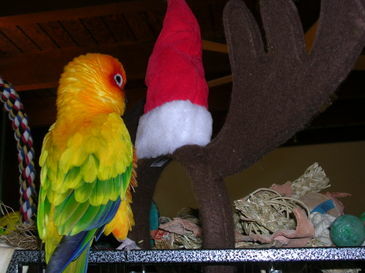 They do seem confused as to why we don't have feathers. 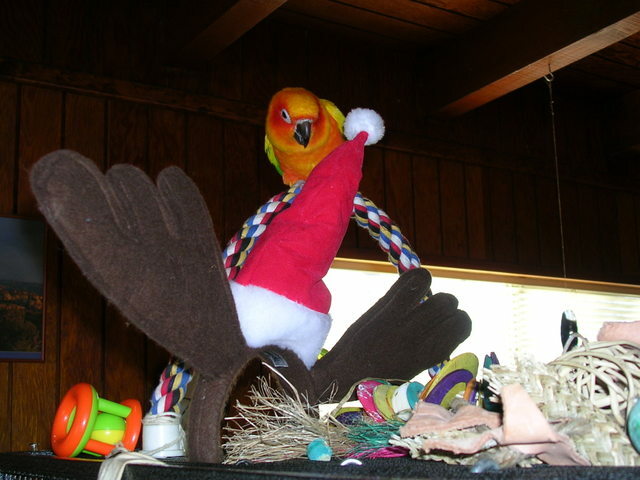 Here's Sunny the sun conure doing one of this routines for the camera. We call it being "snakey." It's a mindset he gets into regularly that seems to involve some kind of avian-style Zen conciousness related to his toys. Obviously Sunny thinks he's being really charming. What do you think?